Do you ever feel as though you are sort of getting screwed over by the space-time continuum? Like, your psychological pace at getting things done and having the thought process and committing to projects seems normal to you but then you insert yourself into the real world and everything skews a bit and you suddenly think HEY where did all my nice time go? Yeah, that’s about where I am now. In my head, I have knitted at least a dozen sweaters so far this year. In reality, I am still on my third. In fact, my impulses at the moment are almost entirely sweater related, either for those currently on the needles (Autumn Rose, still very close to done and yet not quite), those I’d like to have on the needles (have so far narrowed this down to…every sweater pattern in existence), and those I’m designing in my head (no fewer than three, at least this week). Unsurprisingly, this creates a sort of backlog of momentum and despite the fact that the knitter in my head has already accomplished these things, my actual hands are rather limited. This may explain why, yet, when I pick up my needles or make a step towards casting on something new, it is not sweaters, it is socks. Socks appear deceptively smaller than sweaters, despite their stitch count, and I am sure they appeal more to me in the warm weather than bulky sweaters do. Not to mention, the Sock Summit is coming up and is giving me the best excuse ever to frolic with the sock yarn love. Excuse me, I’ll just be over here in my stash ignoring the material limits of reality for a little bit longer. You can come too, it’s great over here. Stay quiet and we’ll try not to spook the calendar. I AM you, only in another country. So really, your problem is twice as bad as you think it is! Wow, that’s exactly how my brain works re: knitting! Stupid confines of reality! I also feel this way only my stash is so much small than your stash, your stash could eat my stash as an amuse-bouche. It must be a viral condition of the knitting world. Did you just read my thoughts?! Because this is exactly what goes on in my head! I’m really managing to keep the stash down (I will be moving upcountry soon and I don’t want to be given the muggle’s eye by the removal company folks), but pretty much everything in there is a finished product. Waiting to be turned into reality, of course. JESUS, that is your stash??!?!? 1. I would be in HEVAN! 2. Your stash blows mine right out of the water. If only I had room in my tiny ny apartment to house that much yarn. I know exactly how you feel (except that my stash is bigger, which is a lot for me to admit out loud). Sigh. I’m showing the photo of your stash to Chris (fiance) as soon as he gets home because then he’ll understand that I’m not the only one who lives like this! The worst is when you knit the sweater several times in your head, so that by the time you get around to knitting it in reality you no longer want to knit it AGAIN…and now you have all that yarn just sitting there! On the flip side, my stash management issues/imaginary wardrobe spring from my sewing habit. Yes, I sew for myself when I’m done sewing for other people. Which means I *rarely* sew for myself, and the piles of mending/re-fashioning are rather seriously threatening. At least to the untrained eye. Not counting the pattern “archive”. I’m trying fiercely not to allow the yarn stash to grow to such volume, and so far I’m doing OK. But I haven’t been seriously tested, either. I’m afraid of what might happen, really. On the flip side, my very first sweater (plain top down, raglan, rather loose dealie) is going quite well! I’d be rather peeved if it wasn’t, as the pattern seems very straight forward, but I haven’t gotten to dividing for the sleeves yet, either. The “shape the back of the neck, and then cast on more for the front and join in a round being careful not to twist” went *smashingly*, though, if I do say so myself. I can see where this gets addicting. Heaven help me when I get to socks…. oh, yeah, reality. still, it sounds pretty interesting in your brain, can’t wait to see the new designs. Ah yes, I hate when reality intrudes. 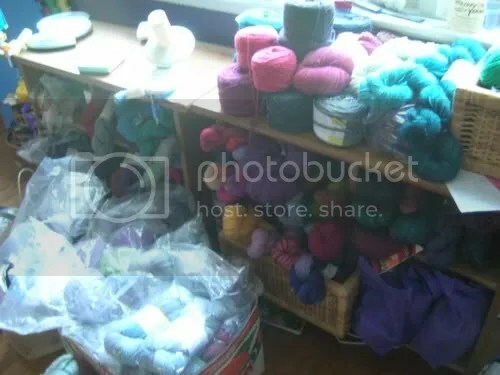 All of my stash in out in public right now due to the reno and not only does Phil now know how much I have but I have also been rudely jolted back to reality at the sheer amount of yarn I possess. I thought I had knitted a lot more of it too. Completely agree with this. how is it that it takes more than a couple weeks to knit a sweater?! I create little knitting schedules for myself, estimating when I’ll start this project or get that project off the needles, all in a desperate attempt to feel connected to my knitting when I’m at my office and sadly unable to knit. And that schedule? No bearing on reality whatsoever. Too many knits, too little time!! my knitting fantasies are so much better than my knitting reality. heh. Maybe if we all push the limits of knitting reality together, we can get something happening. One, two, three…push! My sentiments exactly. My stash has grown to occupy its own closet now, and I have to dive in once in a while just to remind myself of my former enthusiasm for the various projects-in-waiting. I was wondering if that was a yarn store or your stash. I have just as big a stash but it is not all in one spot and it is mostly hidden. I like your colour choices of pinks, blues and purples. I was just cleaning up my blog a bit and noted that last July I knit myself two sweaters and finished a third. This year I’ve accomplished one infant sweater and started 4 pairs of socks. I can’t blame it on the heat because goodness knows we haven’t had any of that! I think I’ll adopt your Material Limits of Reality theory as the cause. If only I could learn to read and knit at the same time! Sometimes I can listen to books on CD but there are so many print books out there, just waiting for me! Don’t forget about the forthcoming fingerless mitts pattern!